I'm Clare, known online as Aimetu which is a made up name from the French words for 'friend/like' and 'you/your'. I live in the Midlands with my Hubby and grown up son, we've lived here over 30 years. Our grown up daughter lives in Wales which is beginning to feel like a second home. Life was quite difficult in 2017 as I had an accident and broke my left ankle in three places and my right foot. I am still not 100% mobile but everything is improving. Life for us in 2018 will be changing as at the end of January as Hubby is retiring, we are looking forward to days out, holidays and just being able to chill a little. 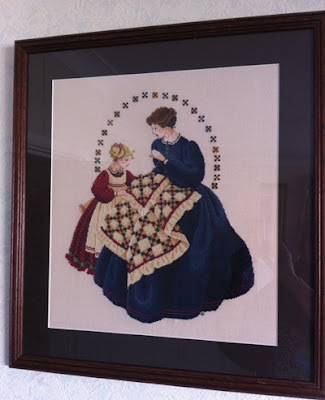 I have been stitching since I was in my late teens; I'm not sure how or why I started. My Grandmother was very crafty, her main hobby was flower arranging. My Mum loves crafts too, her main hobby is quilting but she has made lace, tatting, knits, does machine embroidery and card making. Her quilts have been shown in international exhibitions. I have two blogs; Aimetu's (about my travels and our wine tasting hobby) and Aimetu's Stitching (about my crafts). I started my crafting blog on 30th March 2008 so this year is my 10th birthday. Why did I start blogging? I have been involved with online forums for a while and for the last 7 years have hosted Needlecaft Haven - blogging seemed a great way of keeping an online diary in one place about my main crafts whilst the forums have many sections. I stitch for purpose, usually gifts. It is rare for me to stitch for myself. I love exchanges and in the past have enjoyed Round Robins. 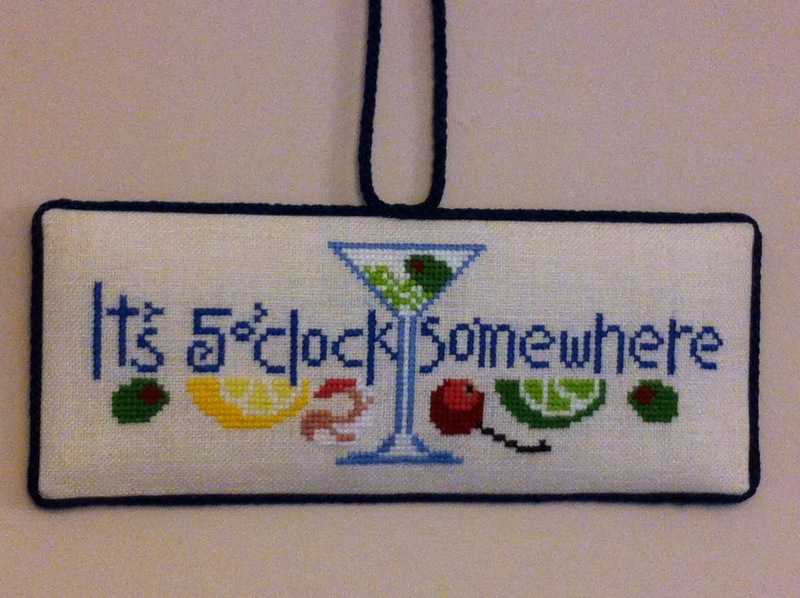 I stitch in the Four Seasons SAL on Needlecraft Haven and try to complete the Monthly Challenge. 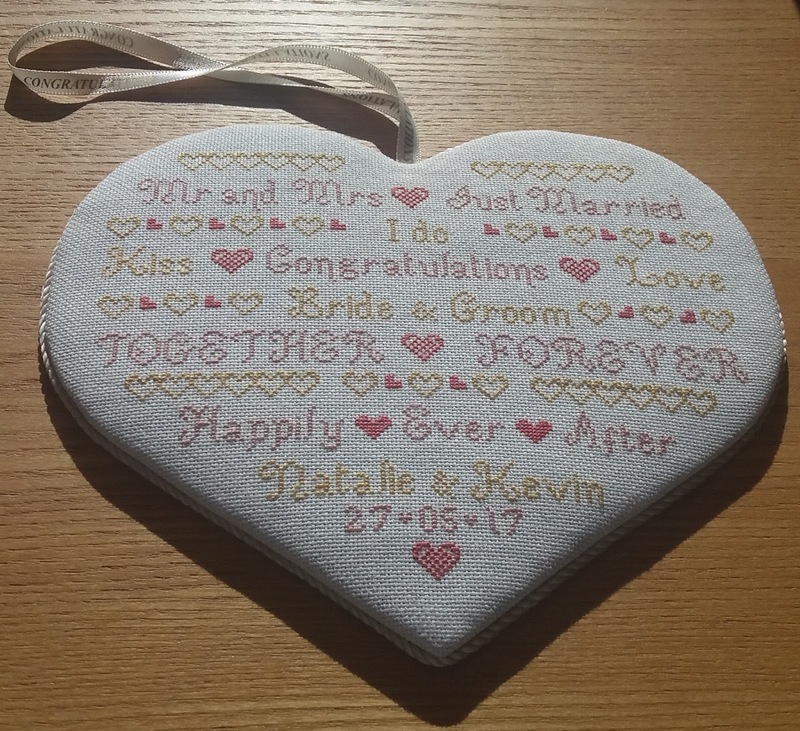 I do enjoy gift stitching, it's fun to source a chart for a particular person and occasion, always enjoyable to stitch any piece and then there is the added pleasure of seeing the gift received. 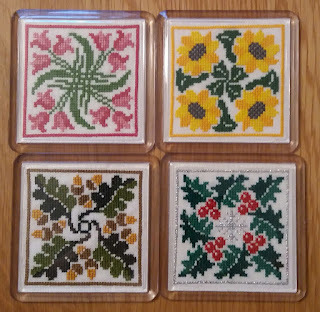 I don't have a particular designer; Lizzie Kate, Jardin Prive and Sue Hillis are designers I go to first and I do enjoy stitching Mable Figworthy hardanger designs. That's a tricky one, the biggest piece I stitched was the Millennium Sampler, it took me 18 months and came on many holidays so I have memories of where each square was stitched. I stitched The Quiltmaker for my Mum's 65th birthday which was a challenge as there is so much blue in the skirt. It was pure pleasure to stitch a sampler for my daughter's graduation and tricky work keeping my Hubby's family tree secret. I remember once stitching on a piece of hardanger in the garden and paused to enjoy a cup of coffee ... and spilt it on my work. I wouldn't wash out so after the piece was finished I dyed it in coffee - not quite the finish I wanted but it looked ok. I am always trying to think of new things to use my stitching so finishing ideas are always good. The use of my hands is limited as I have Multiple Sclerosis so really stitching, card making, baking and sewing is enough for me, I can manage a little beading but knitting or crochet are impossible as I do not have the dexterity in my fingers. I do have a few pieces unfinished, I'm not sure if they will ever get done. I also have quite a few stitched pieces that have not been made into anything. I have recently finally framed a Round Robin piece from 2012 and a year sampler I stitched over 10 years ago. I should finally finish the others too. 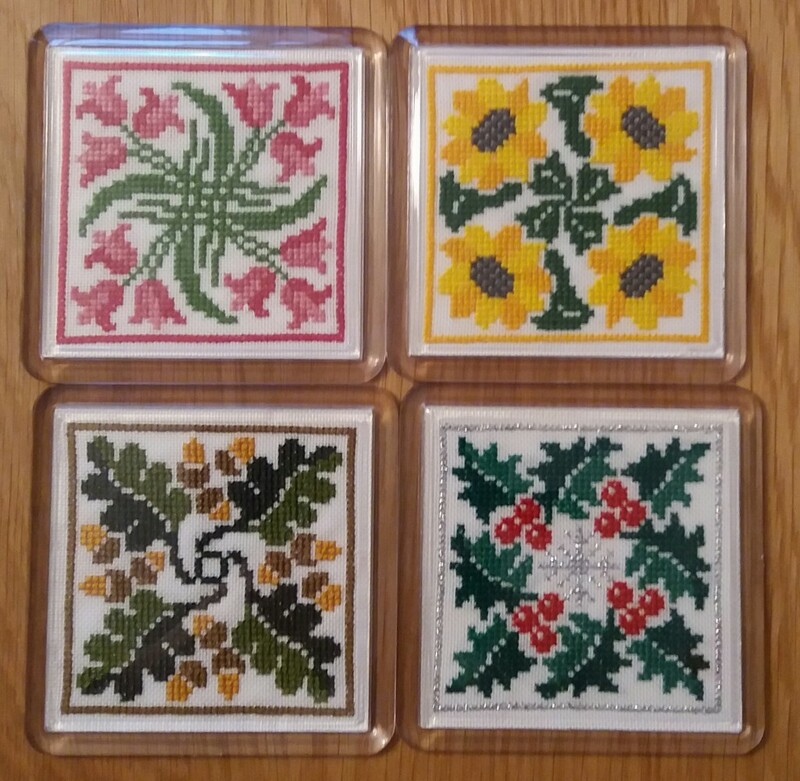 I guess the table cloth in my very first blog as it is a mix of stitching and hardanger. I took time to plot this so the sayings faced everyone around the table. All the sayings mean something to me; I love to see it on the table. No secrets, no jokes, I'm just me and some would say that is more than enough !! Lovely to read about how you got into stitching and blogging Clare! You are so generous with your time organising NH, all the gifts you send and exchanges you organise. I enjoyed reading about your pieces that you are proud of Clare. 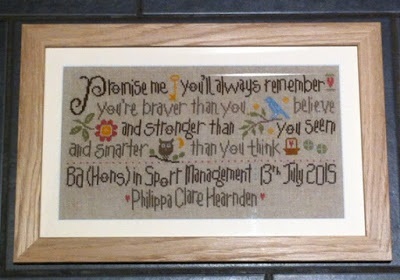 How lovely to read more about you and your stitching journey, Clare. I am new to NH but enjoying it very much. I'm glad you like NH - it's a very friendly place. Howdy, I know of you~ It's nice to read your backstory. I didn't know about the MS. 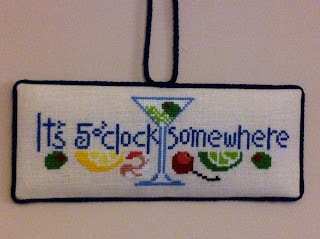 Thank goodness for needlework! I love how you did the tablecloth so everyone can see something. Hi, Clare - so nice to meet you! 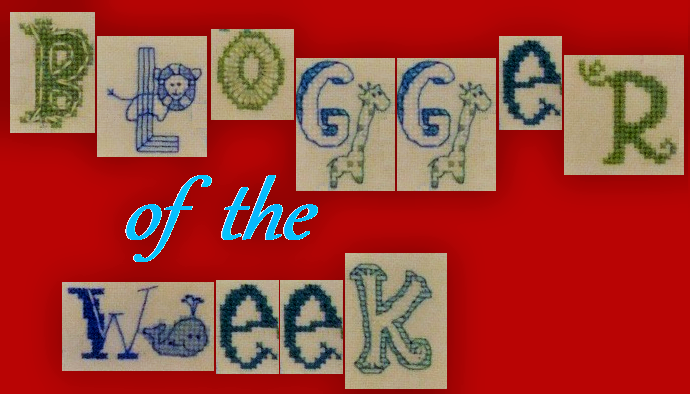 Enjoyed seeing your lovely stitching and just hopped over to your stitching blog and became a new follower. Thanks Deb, I popped to your blog too, great work ! It was nice to read a little more about you. Love the picture you stitched for your mother! Hello Clare,I have enjoyed reading about about you and your crafting,you have done beautiful stitching.I do like your thoughtful table runner. Very nice to meet you. Your work is very beautiful. Very pleased to meet you Clare and see all your beautiful stitching! It's always nice to find out a little more about you, Clare. You do a great job with NH and all your other activities. So nice to meet you here, too. You also show some wonderful stitched pieces. 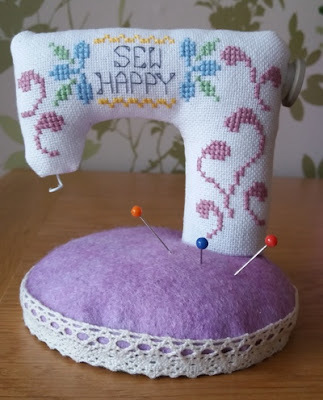 That little sewing-machine pincushion is just awesome. So lovely pieces, especially the embroiderer and the sewing machine pincushion.AriadnefromGreece!